1 of 5 Bring a large pot of lightly salted water to a boil. Add macaroni and cook 7 minutes or per package directions; drain. 2 of 5 Meanwhile, melt butter in a saucepan over medium heat. Whisk in flour, cooking until bubbly. While whisking, add 1 1/4 cups of the milk in a thin stream. Season with salt, black pepper and cayenne. Bring to a simmer and cook 2 minutes. Remove from heat and mix in 1 cup of the cheddar and the American cheese. Fold into macaroni in a large bowl. Let cool slightly, then stir in mozzarella and remaining 1 cup cheddar. Spread mac and cheese onto a rimmed sheet. Cover with plastic and refrigerate overnight. 3 of 5 Use a scoop to spoon out about 1/4 cup of the mixture at a time and shape into 2- to 3-inch balls, compressing slightly. 4 of 5 Whisk eggs with remaining 1/4 cup milk. Dip balls in egg mixture, then coat in panko. 5 of 5 Heat oil in a deep 4-quart pot to 360 degrees on a deep-fry thermometer. 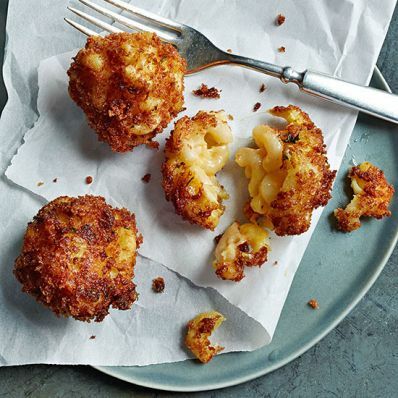 Fry 6 or 7 mac and cheese bites at a time for 3 to 4 minutes per batch, until golden. Serve immediately. Per Serving: 13 g carb., 5 g sat. fat, 31 mg chol., 14 g Fat, total, 255 mg sodium, 6 g pro., 0 g fiber, 200 kcal cal.